Folks in Georgia know there’s not much that can beat a tender, juicy steak. The Peach State knows how to do steak right, from aging the perfect cuts to seasoning them to perfection. Combine that with homegrown sides and an all-star wine list and you’ve got the perfect meal that’s fit for royalty. You’ll want to lick your plate clean at these 10 best steakhouses in Georgia. 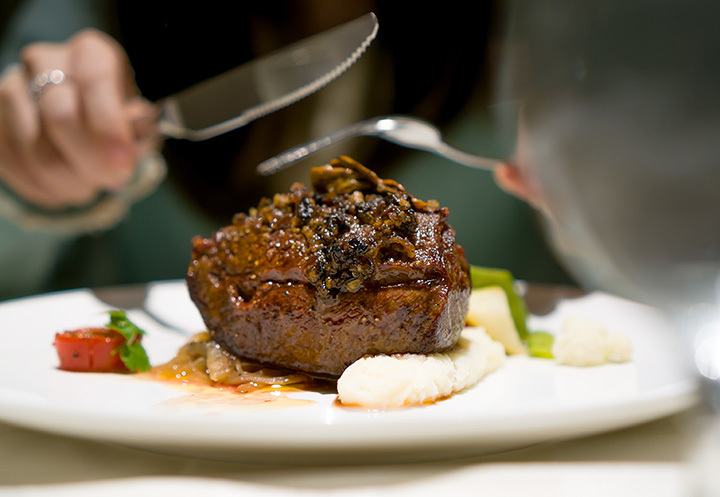 It’s places like Marcel that have kept the classic steak as an American favorite. Marcel is truly dedicated to crafting the perfect steak every time by keeping quality high and flavors abundant. They feature Linz Black Angus beef, USDA Prime, and Natural Prime cuts, which mean no hormones to give you the best possible taste. Their extensive menu makes it hard to choose just one, especially since they excel in everything they create. They know their way around a steak, offering a variety of cuts sourced from local farmers to deliver a heaping helping of freshness in every bite. They’re also a prime source for local craft brews and an impressive wine list to complete your experience. Featuring some of the best flavors of Argentina, this steakhouse is an experience unlike any other. They’ve won countless awards for their fare and service, and just one bite tells you why. If there’s someone you’re hoping to impress, book one of their private dining rooms for the total package of dinner and ambiance. Reminiscent of a 1920s-era eatery, your experience here lacks for nothing. They’ve got the best of everything, from decor and classic steakhouse vibes to tasty steaks and charcuterie to a wine list any sommelier would find exciting. There’s nothing quite like it anywhere around, and will easily become your go-to spot anytime you’re craving a steak. From tempting seafood and pasta dishes to mouth-watering steaks, every meal is made with you in mind. They take great pride in creating some of the best food on the planet, and their dedication shines through in every bite. With a longstanding culinary team that’s been cooking together for nearly two decades, you can expect nothing short of perfection every time you visit this Buckhead fixture. Frankie’s is everything a good steakhouse should be: cozy, inviting, refined, and attentive to detail. They’ve got all your steakhouse favorites and a wine menu designed to bring out their best flavors. They’re known to complement your experience with live, studio-quality music that will make you feel as though you’ve stepped back to a simpler, vintage era. It won’t be an inexpensive meal, but their fans agree it’s well worth the price. Hunter’s proves you don’t have to spend a fortune to get a good steak. A far cry from upscale steakhouses, Hunter’s Pub and Steakhouse keeps their cuisine low key without sacrificing quality or taste. They believe simplicity is best, and their fans agree. For the past 20-plus years, their reputation as one of Atlanta’s finest steakhouses has never wavered. Their classic interior features rich woods, leather booths, and soft lighting to set the tone for a truly authentic steakhouse experience. Serving up USDA prime beef to ensure your steak is nothing short of high-quality, you won’t find a better steak anywhere in the city. Don’t let the name fool you—there’s nothing “minimal” about this steakhouse. Housed in a former tannery, this place features the iconic steakhouse vibe with a club-like feel and one of the best menus in town, including a generous selection of USDA Prime options. Their customers have been known to drive from hours away just to get their fix. Fresh Black Angus steaks are cut by hand daily and cooked to perfection. Their guests also rave about the reasonable prices and plenty of variety.